MPDS was developed by Jeff Clawson from 1976 to 1979 when he worked as an emergency medical technician and dispatcher prior to medical school. He designed a set of standardized protocols to triage patients via the telephone and thus improve the emergency response system. Protocols were first alphabetized by chief complaint that included key questions to ask the caller, pre-arrival instructions, and dispatch priorities. After many revisions, these simple cards have evolved into MPDS. MPDS today still starts with the dispatcher asking the caller key questions. These questions allow the dispatchers to categorize the call by chief complaint and set a determinant level ranging from A (minor) to E (immediately life-threatening) relating to the severity of the patient's condition. The system also uses the determinant O which may be a referral to another service or other situation that may not actually require an ambulance response. Another sub-category code is used to further categorize the patient. The system is often used in the form of a software system called ProQA, which is also produced by Priority Dispatch Corp.
Each dispatch determinant is made up of three pieces of information, which builds the determinant in a number-letter-number format. The first component, a number from 1 to 36, indicates a complaint or specific protocol from the MPDS: the selection of this card is based on the initial questions asked by the emergency dispatcher. The second component, a letter A through E (including the Greek character Ω), is the response determinant indicating the potential severity of injury or illness based on information provided by the caller and the recommended type of response. The third component, a number, is the sub-determinant and provides more specific information about the patient's specific condition. For instance, a suspected cardiac or respiratory arrest where the patient is not breathing is given the MPDS code 9-E-1, whereas a superficial animal bite has the code 3-A-3. The MPDS codes allow emergency medical service providers to determine the appropriate response mode (e.g. "routine" or "lights and sirens") and resources to be assigned to the event. Some protocols also utilise a single-letter suffix which may be added to the end of the code to provide additional information, e.g. the code 6-D-1 is a patient with breathing difficulties who is not alert, 6-D-1A is a patient with breathing difficulties who is not alert and also has asthma, and 6-D-1E is a patient with breathing difficulties who is not alert and has emphysema/COAD/COPD. This Protocol was created to handle the influx of emergency calls during the H1N1 pandemic: it directed that Standard EMS Resources be delayed until patients could be assessed by a Flu Response Unit (FRU), a single provider that could attend a patient and determine what additional resources were required for patient care to reduce the risk of pandemic exposure to EMS Personnel. Whilst MPDS uses the determinants to provide a recommendation as to the type of response that may be appropriate, some countries use a different response approach. For example, in the United Kingdom, typically all front-line emergency ambulances have advanced life support trained crews, meaning that the ALS/BLS distinction becomes impossible to implement. Instead, each individual response code is assigned to one of several categories, as determined by the Government, with associated response targets for each. * This may include an emergency ambulance, a rapid response car, ambulance officers, or specialist crews e.g. HART. Other basic life support responses may also be sent, e.g. Community First Responder. ** If an emergency ambulance is unlikely to reach the patient within the average response time, a rapid response car and/or Community First Responder may also be dispatched. The exact nature of the response sent may vary slightly between Ambulance Trusts. Following a Category 2, 3, or 5 telephone triage, the patient may receive an ambulance response (which could be Category 1-4 depending on the outcome of the triage), may be referred to another service or provider, or treatment may be completed over the phone. ^ Clawson, Jeff (2003). Principles of Emergency Medical Dispatch (3rd., reprinting v11.1 ed.). Priority Press. ISBN 9780965889025. ^ International Academies of Emergency Dispatch (2010). "Special Procedures Briefing Protocol 36: Pandemic/Epidemic/Outbreak (Surveillance or Triage)". Retrieved 5 September 2018. ^ Clawson, Jeff. 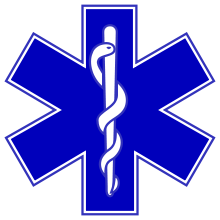 "excerpts from The Principles of Emergency Medical Dispatch" (PDF). National Academy of Emergency Medical Dispatch. Archived from the original (PDF) on 27 October 2011. Retrieved 18 September 2013. ^ England, NHS. "NHS England » New ambulance standards". www.england.nhs.uk. Retrieved 5 September 2018. "Resources Emergency Priority Dispatch Systems". National Academies of Emergency Dispatch. Retrieved 7 February 2011. "About Us". Priority Dispatch Corporation. Retrieved 22 January 2008. George, James; Quattrone, Madelyn (Fall 1991). "Above All-Do No Harm". Emergency Medical Technician Legal Bulletin. 15 (4). "New Pilot Response". Welsh Ambulance Services NHS Trust. Retrieved 18 February 2016.